The past 6 months has seen a very volatile trading range as the stocks bull market has attempted to end its correction and resume its trend to new bull market highs, which has been held back by increasingly worsening debt crisis news out of the Eurozone as the Euro currency block continues to fight to hold itself together whilst it's fragmented political structure ensures that there is always a long delay in policy reaction to bond market crisis events that has had a negative fallout across the worlds banking system and financial markets. One of the most dangerous manifestations of the euro-zone debt crisis is in the freezing up of the inter bank market, with banks reluctant to lend to one another given the rising risks of default as illustrated by the LIBOR rates rising across the world as investors / lenders sought to pull deposits and loans from first euro-zone banks and then from any other bank due to contagion risks in advance of the increasing risks of sovereign default that would not only bankrupt many banks but threaten a collapse of the Euro. The credit crisis is manifesting itself in the LIBOR markets as the dollar and other currencies such as sterling rates rise as investors dump euro deposits in exchange as illustrated by the LIBOR graphs below. The worlds major central banks led by the U.S. Fed re-acted to the credit crisis yesterday by flooding the banking system with dollars to satisfy demand from euro-dumpers, swapping their toxic Euro's for new crisp liquid Dollars (printing dollars for euros) which has had the effect of relieving building pressure that was fast accelerating towards a potential Euro-zone Lehman's event (which was probably no more than 10 days away), at best this can be seen as just buying time, a few weeks at most, as it does not change the fundamentals of the inherent flaws in the Euro-zone which i recently covered at length in (Eurozone Being Swallowed by Expanding Debt Black Holes, Mega Bond Market Profits and Default Booms ). In this respect there is Euro-heads meeting in about 10 days time, which will probably do what needs to be done to kick the can well into 2012, which will give the BULL MARKET time to do what bull markets do. I would not be surprised if the oft speculated on Euro-bond actually materialises over the coming weeks, though I don't keep a too close a eye on developments out of the Europe as each country has its own long list of talking heads thus making 90% of what comes out just confusing noise. So if all the news is bad why is the stock market rallying? The Dow closed up near 500 points at 12,045, barely 6% away from its bull market high. And remember this guy from a couple of months ago ? "know the stock market is finished.".... yeah, certainly looks finished, standing about 10% higher since he spoke in late September. 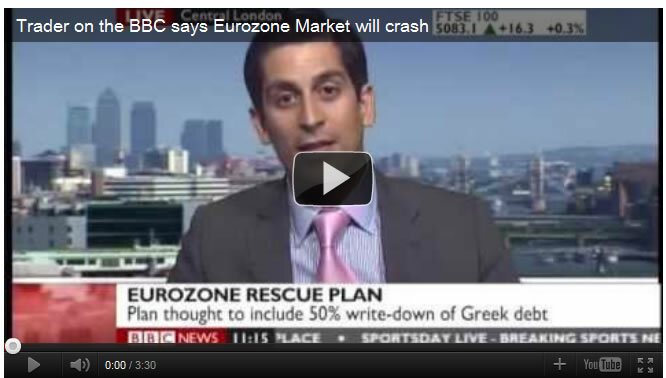 So what is it that approx 90% of the media and 99% of the academics are missing ? 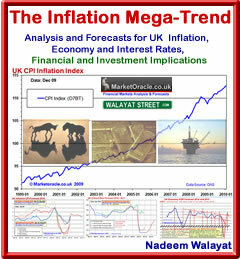 If you have been reading any of my articles over the past few years then you should know the answer, which is that the primary driver for all economies and especially those that are the focus of my analysis, UK then US is the INFLATION MEGA-TREND that over the long-run inflates asset prices exponentially (as measured in free falling fiat currencies). My last look at the stock market (27 Oct 2011 - Stocks Stealth Bull Market Pounds the Crash is Coming Bears with Euro-zone Hammer ) re-iterated why investors should be on guard against the perma-bears and the blogosfear who barely a few days ago were claiming that the a new bear market in stocks (at least for the 10th time in 2.5years) was now definitely in play and that investors should position themselves accordingly. Instead my view has remained constant that investors should view the ongoing corrective trading range as opportunities to accumulate for the long-run at deeply discounted prices on each reaction towards the bottom of the range in anticipation of the resumption of the bull market as part of the Inflation Mega-trend where the objective is to hedge against inflation by means of investing in consistently dividend increasing stocks. The technical picture remains in that the stock market is now trading towards the upper end of its range pending a breakout higher. In terms of probabilities for breakouts, November is a good month for breakouts higher, which the market failed to follow through on this year, however December is an even stronger seasonal month (santa rally), so the probability is even stronger for the Dow to break to new bull market highs during the next few weeks. There is little point in doing an in depth analysis at this point in time as the conclusion would probably be little different given the seasonal factors and existing trading range. However, I will leave you with my more precise thoughts in that my longstanding expectations remain for new bull market highs before the end of this year, which remains possible as illustrated by the trajectory of the trendline which extends to a new high just prior to year end. So whilst the perma-bears, blogosfear and mainstream financial press all are continuously regurgitating noise on imminent financial armageddon in an endless feedback loop, the actual facts are that all investors / traders have had ample opportunities to accumulate at deep discounts in advance of the eventual breakout to new bull market highs by virtue of the fact that dividend increasing, and many other stocks are leveraged to the inflation mega-trend, i.e. they have first call on inflation before consumers. Ensure you are subscribed to my always free newsletter to get my next analysis in your email in box.